Harvard's archivist Megan Sniffin-Marinoff will talk with us about the fascinating contents of the university's archives, and show some of the collection, over dinner at the Sheraton Stamford on Thursday, April 25. The Harvard University archives, located in Pusey Library in Harvard Yard, contain a wealth of historical treasures that tell the story not just of the university and its growing influence over its three and a half centuries, but through Harvard, of the history of Massachusetts, the United States, and American higher education. Since 2004, the university's archivist, Megan Sniffin-Marinoff, has had the responsibility for documenting and cataloguing that material - from the records of John Hancock's tumultuous tenure as Harvard treasurer, to exams and syllabi that trace the development of the curriculum in the 19th century, to stories of 20th-century student protests and their colonial-era predecessors. 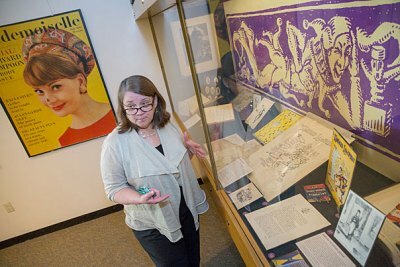 On Thursday April 25, she will talk with us about the collection and her work, and show materials from the archive, including some that showcase connections between Harvard and Connecticut. Don't miss this insider look into the history of everything Harvard. Location: the Stamford Sheraton. Price: $49 for HCFC members and their guests, and $59 for non-members, including dinner and validated parking in the hotel garage. Cash bar is separate. Cocktails begining at 6 pm, with dinner and Ms. Sniffin-Marinoff's remarks following at 7 pm.